00:17 WOUNDED FOR OUR TRANSGRESSIONS AND BRUISED FOR OUR INIQUITIES. 00:45 WELL, A HEARTY SHALOM TO ALL OF YOU. 00:53 AND WE ARE LOOKING AT ISAIAH AREN'T WE? 00:57 SHALOM JEFF, HOW ARE YOU? 00:58 ISAIAH IS A GREAT STORY. 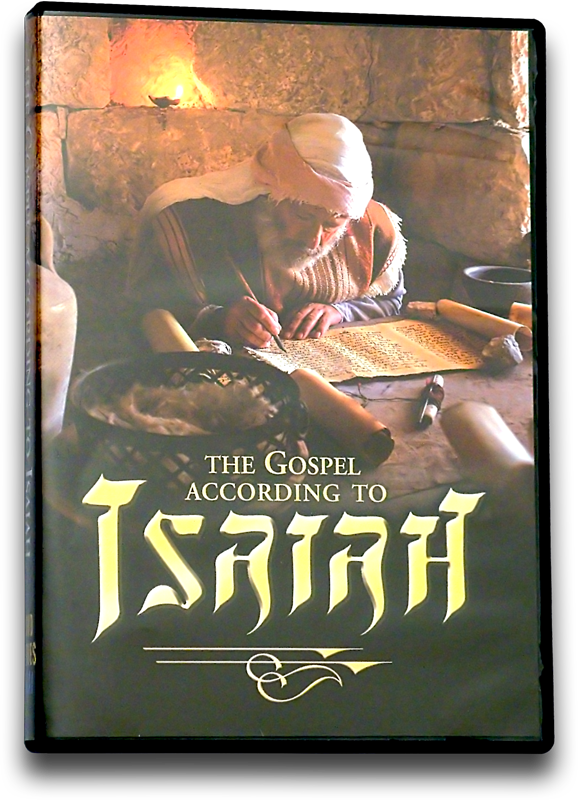 00:59 YES, ISAIAH TELLS A GREAT STORY AND ON THE MENU TODAY, ISAIAH 53:7. 01:17 WHO DO YOU THINK THAT'S TALKING ABOUT? 01:20 I THINK SO, IN FACT JUDAISM SAGES THOUGHT SO FOR MILLENNIA. 01:26 WE'RE GOING TO LOOK AT THIS PERSONALITY WHO IS DESPISED AND REJECTED. 01:29 WHO WENT OFF AS A SHEEP TO THE SLAUGHTER AS WE CONSIDER THE GOSPEL ACCORDING TO ISAIAH. 01:36 ALL WE LIKE SHEEP HAVE GONE ASTRAY. 01:38 WE HAVE TURNED EVERYONE TO HIS OWN WAY. 01:41 AND THE LORD HATH LAID ON HIM THE INIQUITY OF US ALL. 01:45 HE WAS OPPRESSED AND HE WAS AFFLICTED YET HE OPENED NOT HIS MOUTH. 01:55 IS DUMB SO HE OPENETH NOT HIS MOUTH. 02:03 AND MADE INTERCESSION FOR THE TRANSGRESSORS. 02:16 WERE SHED BEFORE HE ACTUALLY GOT TO THE CROSS. 02:25 ON ONE QUIET MORNING SOME TWO THOUSAND YEARS AGO. 02:36 THEY WOULDN'T DO IT. 02:38 THE GOSPEL AUTHORS TELLS US THEY WERE HEAVY WITH SLEEP. 02:41 AND JESUS SAID "COULD YOU NOT PRAY WITH ME BUT ONE HOUR?" 02:46 JESUS WAS IN THE THROWS OF TRAVAIL, PAINED AS HE WAS ANTICIPATING THE NEXT MOVE. 02:56 JUST ANTICIPATED A GOOD NIGHTS REST AFTER A LONG PASSOVER SEDER, THE LAST SUPPER. 03:02 BUT JESUS HIMSELF KNEW THAT THE PASSOVER WAS THE COUNTDOWN TO HIS FINALE, TO HIS ENDING. 03:08 AND HE KNEW HE'D GO FROM THIS GARDEN TO THE CROSS. 03:28 SO IT HERE JESUS AS HE'S CONFRONTED WITH HIS HORRIFIC DEMISE SWEATS BLOOD PROFUSELY. 03:43 THE "BET HAMIKDASH", THE TEMPLE, THE HOUSE OF GOD. 03:52 IT WAS DURING THIS HOLIDAY WHEN JESUS FIRST ARTICULATED, "I MUST BE ABOUT MY FATHER'S BUSINESS". 04:01 AND WHAT'S THE BUSINESS OF GOD IN THE HOUSE? 04:03 COME PASSOVER TIMES THE LAMBS ARE LINED UP FOR THE SLAUGHTER. 04:08 AS ISRAELITES WOULD BRING THEIR LAMB IF THEY COULDN'T BRING ONE AFAR THEY'D PURCHASE ONE NEAR. 04:15 BUT OF PRIMARY IMPORTANCE WAS THE SLAUGHTER OF THE INNOCENTS, THE SLAUGHTER OF THE LAMBS. 04:41 THAT THE MESSIAH WOULD COME AND THAT HE HIMSELF WOULD TRAVAIL. 04:51 AS HE LABORS BENEATH THE BURDEN OF CALVARY'S CROSS. 04:59 AND I WANT YOU TO PICK IT UP IN YOUR VERSION. 05:02 I'M GOING TO PICK IT UP IN MINE IN VERSE 11. 05:11 HE WILL LABOR IMMENSELY UNDER THE PRESSURE OF INNER AGONIES. 05:20 AND HE WILL EVEN BE SATISFIED WITH IT, PAINFUL THOUGH IT IS. 05:23 HE SAYS HE'LL SEE THE TRAVAIL OF HIS SOUL AND BE SATISFIED. 05:51 IS HE'LL INCREASE HIS SWAY ON PLANET EARTH. 05:56 BUT, RATHER HE WILL BRING MANY SONS AND DAUGHTERS TO RIGHTEOUSNESS. 06:01 AND THEN THE PROPHET IS EXPLICIT. 06:05 HE FINISHES THE VERSE SAYING. 06:40 ISAIAH SAYS "HE BEARS THE INIQUITIES OF OTHERS". 06:44 AND HE DOESN'T JUST SAY IT HERE. 06:46 THE CHAPTER FINISHES UP ON SUCH THE SAME NOTE. 06:49 HE SAYS IN CHAPTER 53:12 IN THE SECOND PART OF THAT VERSE HE SAYS. 06:59 YOU NEED JESUS DIED BETWEEN TWO THIEVES WHO SAY "LISTEN, WE DESERVE TO BE HERE". 07:04 JESUS DIED WITH THE GUILTY THOUGH HE HIMSELF WAS INNOCENT. 07:09 "THAT HE WILL BE NUMBERED WITH THE TRANSGRESSORS". 07:23 BUT THAT HE HIMSELF BORE SIN IN THE PROCESS OF HIS DEATH. 07:27 HE TOOK ON THE PENALTY OF SIN SO WE WOULDN'T NEED TO DO SO. 07:31 AND THEN IT'S MADE EXPLICIT AS THIS SECTION COMES TO A CLOSE. 07:51 THE FRUITS OF MY BAD LIVING AND I JUST DON'T HOW TO EXTRICATE MYSELF IN THIS. 07:55 I DON'T HOW TO GET OUT." 07:57 FAIR ENOUGH, IT'S A REASONABLE QUESTION. 08:08 AND SET YOU FREE AND ENABLE YOU THEN TO WALK IN THE NEWNESS OF LIFE. 08:13 YOU SAY "WELL MISTER THAT SOUNDS LIKE CHRISTIAN PREACHING". 08:16 WELL, I GRANT THAT IT IS BUT IT'S ROOTED IN OLD TESTAMENT BIBLICAL LITERATURE. 08:20 IN THE 8TH CENTURY BEFORE CHRIST WE HEAR FROM THE MOUTH OF ISAIAH THAT THE MESSIAH WOULD COME. 08:27 AND WHAT DOES HE TELL US ABOUT THAT MESSIAH? 08:29 THAT HE LABORS IMMENSELY UNDER THE BURDEN OF SIN, THAT HE EXPERIENCES TRAVAIL IN HIS SOUL. 08:40 AND HE SAW ME AND HE KNEW THAT GOOD WOULD COME OF IT. 08:44 HIS LIFE SEEMED TO BE COMING TO AN INGLORIOUS END BUT HE LIVES ON. 08:54 AND WALK IN THE NEWNESS OF LIFE. 08:56 ISAIAH SAYS THAT "HE SEES THE FRUIT OF THE TRAVAIL OF HIS SOUL AND BE SATISFIED". 09:01 HE SAYS THAT "BY HIS RIGHTEOUSNESS IMPUTED TO US WE ARE MADE RIGHTEOUS". 09:20 THE PLACE WHERE JESUS BEGAN SHEDDING HIS BLOOD SOME TWO THOUSAND YEARS AGO. 09:39 THE WORD "PARADISE" COMES FROM THE WORD MEANING "ENCLOSED GARDEN"
09:44 HENCE THE EXPRESSION GOD HAD IN THE GARDEN OF EDEN IS DEEMED "PARADISE"
09:48 BECAUSE YOU'RE LOOKING AT A SECLUDED AREA THAT'S CORDONED OFF FROM THE REST OF THE WORLD. 09:52 IN CERTAIN RESPECTS THE GARDEN OF GESTHEMANE REMINDS ME OF THAT. 09:58 THIS IS A GARDEN, IT'S A PLACE CUT OFF FROM THE REST OF THE WORLD AND A BUSY WORLD AT THAT. 10:10 AND WHAT'S LEFT OF THE EASTERN GATE. 10:13 IT'S ALL SEALED UP RIGHT NOW. 10:14 PEOPLE DON'T GO IN THERE ANYMORE, BUT PEOPLE DRIVE AROUND IT. 10:28 BECAUSE THIS LOUD SPEAKER IS SET UPIN THE ARAB CORRIDOR NOT FAR FROM ME. 10:32 SOME THINGS HAVE CHANGED, SOME THINGS HAVEN'T. 10:43 WHERE JESUS BEGINS HIS PATHWAY TO HIS PERSONAL ARMAGEDDON. 10:53 MANHANDLED BY SOLDIERS AND TAKEN AWAY. 10:58 AS THE SUN WENT UP HE WAS ON CALVARY'S CROSS. 11:01 SOME TIME HAD PASSED, HE WAS CRUCIFIED, BURIED AND HE HAD RISEN. 11:16 AT THE HOUR OF PRAYER, THE NINTH HOUR. 11:27 BECKONING ADHERENTS TO PRAYER, THIS WAS DIFFERENT. 11:34 AND AS THE STORY GOES THEY HAPPENED UPON A LAME MAN, SOMEONE WHO HAD BEEN PARALYZED. 11:45 AND THIS MAN RAISES FROM HIS MISERABLE ESTATE. 11:49 TRANSFORMED AS HE WAS LITERALLY, NOT JUST TO MENTION INTERNALLY, HE'S CLINGING ON TO THESE MEN. 12:04 ONE OF THE FIRST MESSAGES ON RECORD TO JEWISH PEOPLE. 12:13 ABOUT THE WORK OF JESUS ON CALVARY'S CROSS. 12:16 THEY USED THIS AS A TEACHING OPPORTUNITY. 12:33 THE COMMONER AND RULER ALIKE. 12:35 YOU REALLY WEREN'T AWARE; YOU DIDN'T KNOW WHAT WAS HAPPENING". 12:37 HE SAYS IT WAS DONE IN IGNORANCE. 12:53 HAD PREDICTED THAT THE MESSIAH WAS GOING TO SUFFER. 12:59 PARTICIPATED DIRECTLY IN THE ACT WEREN'T AWARE OF WHAT WAS HAPPENING". 13:06 WHAT WAS PREDICTED BY THE MOUTH OF THE PROPHETS. 13:15 HE SAYS IN VERSE 19, IN THE WAKE OF ALL THIS. 13:30 THERE'S SOME BEAUTIFUL PROMISES AND POSSIBILITIES HERE. 13:35 THERE'S A PROBLEM AS WELL. 13:36 PEOPLE DON'T LIKE TO CHANGE. 13:38 PETER GETS UP AND SAYS "LISTEN, YOU MUST NEEDS REPENT". 13:43 AND THE WORD REPENT IN HEBREW, "TASHUVA", MEANS TO CHANGE YOUR DIRECTION. 13:47 SOME PEOPLE ARE GOING AWAY IN LIFE BUT IT'S THE WRONG WAY. 13:50 IT'S NOT THE WAY OF THE CROSS, ITS A WAY OF LOST TO THEM PERSONALLY. 13:53 THERE JUST ON A HIGHWAY TO HELL AND HE SAYS HERE "REPENT AND BE CONVERTED". 14:01 NOW PEOPLE HAVE COME UP TO ME AND THEY SAY "MR. SEIF HOW LONG HAVE YOU BEEN A CONVERTED JEW?" 14:07 THAT I DON'T UNDERSTAND MYSELF TO BE A CONVERTED JEW. 14:09 I DO UNDERSTAND MYSELF TO BE A CONVERTED SINNER. 14:12 AND IT IS NOT A SIN TO BE A JEW. 14:20 TO DO A RESEARCH PROJECT ON THE MESSIANIC MOVEMENT IN ISRAEL. 14:23 MORE AND MORE JEWISH PEOPLE ARE COMING TO FAITH. 14:31 JEWISH PEOPLE THAT WERE FOLLOWERS OF JESUS. 14:57 BY VIRTUE OF AN EXPERIENCE WITH THE JEWISH MESSIAH. 15:01 PETER HERE IS TALKING TO JEWS AND HE IS SAYING "REPENT AND BE CONVERTED". 15:07 HE SAYS THEN, "THAT YOUR SINS MIGHT BE BLOTTED OUT". 15:14 THAT JUST DOESN'T COME OUT WITH LAUNDRY. 15:20 THERE'S A WAY THAT PEOPLE CAN BE BORN ANEW. 15:27 AND GET ANOTHER SHOT AT IT, JESUS SAYS. 15:39 AND THEN HE SAYS THAT "TIMES OF REFRESHING WOULD COME FROM THE PRESENCE OF THE LORD". 15:46 HEAR ME ON THIS, THERE'S NO WEIGHT GREATER THAN A GUILTY CONSCIENCE. 15:55 OF KNOWLEDGE OF THE FACT THAT THEY HAVE A LIFE POORLY LIVED. 16:11 THEY COULD FIND HEALTH AND HEALING. 16:14 THEY COULD FIND THAT ANIMALS WOULD BE SACRIFICED IN PLACE OF THEM. 16:17 WELL, THAT ACTIVITY HAS LONG SINCE CEASED. 16:20 TODAY JEWISH PEOPLE CAN SAY "WHEN I SIN I'LL JUST GO DIRECTLY TO GOD. 16:24 I DON'T NEED A MESSIAH". 16:26 I CAN UNDERSTAND THAT THOUGHT, BUT THAT CONCEPT DOESN'T COME FROM THE OLD TESTAMENT. 16:41 THERE'S NO REMISSION OF SINS. 16:43 HE TAUGHT ABOUT THE NEED FOR SACRIFICE, FOR PRIESTHOOD. 16:46 AND HERE WHEN PETER SAYS "ONE MUST NEEDS UNDERSTAND THAT JESUS IS THE SACRIFICE AND THE PRIEST. 16:52 LET YOUR SINS BE BLOTTED OUT. 16:54 THEN YOU CAN HAVE A NEW LIFE. 16:56 YOU CAN EXPERIENCE FORGIVENESS. 16:58 REFRESHMENT WILL COME TO YOU FROM ON HIGH". 17:05 THE HOLY SPIRIT CAN BE POURED OUT ON YOU BECAUSE OF THE SAVING OF GRACE OF THE LORD JESUS. 17:12 DO IT, RECEIVE HIM AND GOD BLESS YOU FOR SO DOING. 17:55 THAT'S ISRAEL, THAT'S WHAT WE SEE, THAT'S WHAT WE LOVE. 17:58 THIS IS THE HOLY BOOK OF THE HOLY LAND. 18:01 YOU NEED TO SEE ISRAEL. 18:02 IT MAKES THE SCRIPTURES COME ALIVE. 18:21 THIS IS NOT A CASUAL THING THAT GOD HAS SAID; HE REALLY MEANS HE WANTS A BLOOD SACRIFICE. 18:40 THAT THERE HAS TO BE A SACRIFICE FOR THERE TO BE FORGIVENESS OF SINS. 18:45 IT'S A FASCINATING STORY. 18:47 NOW WE'RE GOING TO LOOK AT SACRIFICE AS IT UNFOLDED IN THE NEW TESTAMENT. 18:52 WE KNOW THE STORY OF JESUS WHO DIED ON THE CROSS. 18:59 DR. TOM MCCALL, IS GOING TO BE ON TAPE. 19:09 FROM THE FIRST CENTURY OF THE CHRISTIAN ERA. 19:12 IT'S A FASCINATING ARTIFACT AND I KNOW YOU'RE GOING TO FIND IT VERY INTERESTING. 19:19 YOU MADE A VERY RARE FIND OF AN EXAMPLE OF A CRUCIFIED PERSON. 19:28 WHEN WAS THIS FOUND AND WHAT WERE THE CIRCUMSTANCES AROUND ITS FINDING? 19:35 IN 1968 A COLLEAGUE OF MINE WAS DIGGING HERE IN JERUSALEM. 19:41 IT WAS ONE OF THESE ACCIDENTAL FINDS. 19:47 GOING BACK TO THE TIME OF CHRIST. 19:50 IN ONE OF THE OSSUARIES THEY FOUND A HEEL BONE. 19:52 THIS IS WHAT'S CALLED THE CALCANEUM OF AN INDIVIDUAL. 20:00 WHICH HAD A NAIL WHICH IS DRIVEN LATERALLY THROUGH A PIECE OF WOOD. 20:04 WE CAN STILL SEE TRACES OF ALL THE WOOD HERE AFTER 2,000 YEARS. 20:11 AND THEN WHAT HAPPENED, THIS THE RIGHT HEEL. 20:15 THE RIGHT HEEL OF A HUMAN FOOT WITH A NAIL THROUGH THE MIDDLE OF IT. 20:21 THERE'S EVIDENCE OF A PIECE OF WOOD ON THE OUTSIDE. 20:29 AND MAYBE IT WILL MAKE IT MUCH CLEARER. 20:31 WE HAVE A NAIL HERE. 20:33 THIS IS ABOUT 11 1/2 cm. LONG, THIS WAS MORE OR LESS THE LENGTH OF THAT NAIL. 20:36 THAT'S THE TYPICAL OF THE ROMAN NAIL. 20:38 IT'S A TYPICAL NAIL SQUARE SHAPED OF THE NAIL BODY ITSELF. 20:43 WHAT THEY DID WAS THAT THEY DRILLED THIS THROUGH A PIECE OF OLIVE WOOD. 20:48 IT THEN FUNCTIONS AS A WASHER. 21:00 AND IN THIS CASE HERE WHAT SEEMS TO BE OCCURRING, THEY THEN NAILED HIM TO THE TREE. 21:04 BUT WHAT HAPPENED, AGAIN, LEFT FOOT OVER HERE, RIGHT FOOT OVER HERE. 21:10 WHAT HAPPENED IT SEEMS THAT WHEN THIS WENT INTO THE TREE THE NAIL BENT AND IT FISH HOOKED. 21:16 AN OBSTRUCTION OF SOME KIND. 21:20 PERHAPS, AND KNOT IN THE WOOD. 21:23 THERE'S SOMETHING HARD IN WOOD. 21:24 WHEN IT FISH HOOKED IT THEN BECAME IMPOSSIBLE TO REMOVE IT. 21:29 YOU SEE HOW THE THING'S BENT OVER HERE. 21:35 SO THEY BURIED THIS INDIVIDUAL WITH THE NAIL IN HIS FOOT. 21:38 NORMALLY, I SUPPOSE THE NAIL WAS REMOVED IF IT COULD BE IN MANY CASES. 21:46 YOU'RE LOOKING AT THE ONLY CASE IN THE WORLD. 21:49 WHERE WE HAVE DIRECT PHYSICAL EVIDENCE OF CRUCIFIXION. 21:53 THE REASONS I THINK ARE TWO. 21:55 ONE THING IS THAT MOST PEOPLE PROBABLY WERE TIED TO CROSSES. 21:58 IF YOU LOOK AT THE GOOD THIEF AND THE BAD THIEF, THEY'RE ALWAYS TIED. 22:00 JESUS IS THE ONLY ONE THAT'S NAILED. 22:02 SO NAILING WAS NOT ALWAYS COMMON. 22:04 I THINK IT MAY HAVE BEEN THE EXCEPTION TO THE RULE. 22:12 IF YOU ARE CONTINUALLY NAILING IT, AFTER A FEW CRUCIFIXIONS YOU HAVE TO MAKE ANOTHER CROSS. 22:19 AGAIN THERE IS NO RELATIONSHIP WHATSOEVER BETWEEN BEING NAILED AND TIED. 22:23 THE BODY IS GOING TO GO INTO SHOCK. 22:25 THE SAME THING HAPPENS. 22:28 AND NOW FOR A CLASSIC MOMENT WITH ZOLA. 22:31 LET'S REVISIT HIS INTRODUCTION TO A SONG CALLED "FOR HIS NAME'S SAKE". 22:37 NOW I WILL BE PLAYING WITH THE TRACK. 22:48 AND WE'LL START WITH THE SONG "FOR HIS NAME'S SAKE". 24:25 WE SAW THE INTERVIEW WITH JOE ZIAS AND WE HEARD ZOLA'S WONDERFUL MUSIC. 24:41 AND IN IT HE MAKES THIS WONDERFUL OBSERVATION. 24:44 IT'S AN AMAZING STATEMENT. 25:03 AND THE WHOLE WORLD MEANS IN THE GREEK "THE WHOLE WORLD". 25:08 YOU DON'T NEED A DOCTOR'S DEGREE IN THEOLOGY. 25:11 I WANT YOU TO HEAR ME ON THIS, PLEASE. 25:22 THAT HE GAVE HIS ONLY BEGOTTEN SON. 25:25 ALL POINTS LEAD TO THIS PLACE. 25:29 WHEN THE BIBLE SAYS THE "WHOLE WORLD", THAT'S THE JEWISH WORLD, THAT'S THE ARAB WORLD. 25:35 GOD'S ARMS ARE BIG ENOUGH TO INVITE EVERYONE AND SO IT IS WITH ZOLA LEVITT MINISTRIES. 25:41 HEAR FROM THIS JEWISH EVANGELIST NOW, PLEASE. 25:44 IF THE LORD IS BECKONING YOU TO MAKE A DECISION, DO IT THIS DAY, DO IT THIS WAY. 25:50 HEAR THE WORD PLEASE. 25:52 GOD PROMISED THAT A MESSIAH WOULD COME, THAT HIS NAME WOULD BE YESHUA. 25:57 HE WOULD BE A SHEEP LED TO THE SLAUGHTER, THAT HE WOULD DIE ON THE CROSS FOR SINS. 26:07 THAT'S NOW DELIVERED TO YOU CUSTOM MADE. 26:20 LET ME GET THAT FORGIVENESS AND THAT NEW SHOT AT LIFE." 26:22 IT'S THE ONLY TIME, JEFF. 26:26 WE HAVE GOT TO MAKE A DECISION OR ONE WILL BE MADE FOR YOU. 26:30 THANK YOU FOR YOUR SUPPORT. 26:31 THANK YOU FOR YOUR PRAYERS. 26:33 SHA'ALU SHALOM YERUSHALAYIM PRAY FOR THE PEACE OF JERUSALEM.